UK betting giant Ladbrokes recently confirmed it will be the title sponsor of the Rugby League Ladbrokes Challenge Cup for one more season at least, extending its current partnership that was secured in 2015. 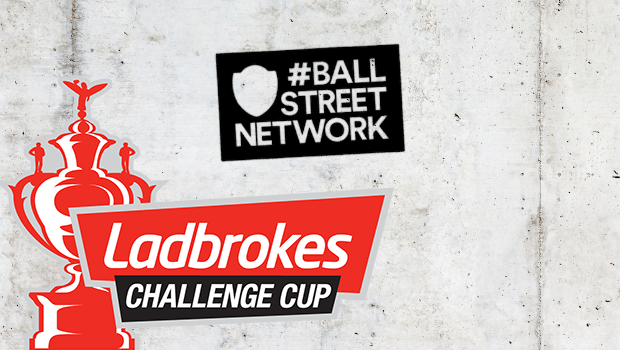 Ladbrokes has also gone into partnership with the Ball Street Network of fan channels for the current season. The joint effort was announced in August following a trial over the final two months of last season, and demonstrates company's ongoing expansion! The decision to continue sponsorship of the Rugby League Ladbrokes Challenge Cup is likely to be at least partly based on the impressive crowd numbers the event drew last year, and this. The 2016 final saw more than 76,000 people watch the game in Wembley Stadium, where Hull FC beat Warrington Wolves by 12 points to 10. Hull held on to the trophy this year, again in front of a large crowd who saw them beat Wigan Warriors by 18 points to 14. Rugby League has gathered more followers over the years, with the age-old debate about whether Rugby League or Rugby Union is better still raging on, of course. In more recent years, especially when it comes to big competitions such as the Challenge Cup, there's been wider coverage by major media outlets such as Sky and the BBC. This is something Ladbrokes can exploit with continuing sponsorship as the sport grows in popularity. The Challenge Cup is a historical institution in the world of Rugby League and the prestige attached to it is a great marketing tool for any company. The Cup itself is 120 years old. Originally made by the Birmingham-based Fattorini family in 1897, it is cleaned and repaired by that very same firm every year. Social media has become an undeniable force in recent years. Twitter and Facebook can make or break a company's reputation overnight, and the power to engage new and existing customers is unparalleled. Not only that, it's a very cost-effective form of marketing. According to a recent blog from ValueWalk, this isn't the only benefit. Showcasing a brand’s values and personality can make it all the more accessible and familiar to customers, and create loyalty. This is important for any gambling company, given that most users of gambling apps will tend to stick with a brand they like. Ladbrokes is keen to increase its social media presence, and the decision to enter into a partnership with the Ball Street Network in the same month it announced renewed sponsorship of the Rugby League Challenge Cup can be seen as part of an expanded marketing strategy to widen engagement. Many younger football fans use YouTube and other social media platforms to keep up to date on the latest developments on and off the pitch, so this deal with the Ball Street Network helps to develop a strong social media presence. It hasn't all been plain sailing for Ladbrokes in the past few years. The recent incident of customers’ confidential information being found outside one of its Glasgow shops means it could face an investigation from the gambling regulator, for example. Credit Suisse has forecast a huge cutback on fixed-odd betting machine stakes. Currently, high-street bookmakers gain about 90% of their profits from gambling machines. Credit Suisse is predicting that this maximum stake will be slashed by the UK government to £2. The outcome of an industry review is due to be made public in November. Tax revenues from bookies are high, so a more modest reduction in the maximum stake is also a possibility. "The move is demonstrative of the progress the company has made." In line with this success, there could be another motive for Ladbroke’s continued investment in sponsorships and social media presence. Over-the-counter business dropped 6% in the first half of this year. Digital business, however, rose 25%, with online gaming sales climbing 11% as well. It's clear that Ladbrokes is moving to capitalise on this new and potentially extremely lucrative business landscape. Visit Ladbrokes Sports today to start wagering all the best odds for the Rugby League Ladbrokes Challenge Cup as well as checkout the extensive betting markets offered for other events!